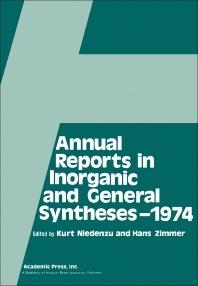 Annual Reports in Inorganic and General Syntheses-1974 presents an organized annual summary of synthetic developments in inorganic chemistry and its related areas. The book discusses the chemistry of simple and complex metal hydrides of main groups I, II, and III, boron, aluminium, gallium, indium, thallium, silicon, germanium, tin, lead, phosphorus, arsenic, antimony, bismuth, chalcogens, halogens, and pseudohalogens. The text also describes the chemistry of scandium, yttrium, lanthanides, actinides, titanium, zirconium, hafnium, vanadium, niobium, tantalum, chromium, molybdenum, tungsten, manganese, technetium, rhenium, iron, cobalt, nickel, ruthenium, osmium, rhodium, and iridium. The chemistry of palladium, platinum, copper, silver, gold, zinc, cadmium, and mercury is also encompassed. The book concludes by demonstrating the photochemical syntheses of inorganic compounds. Chemists, chemistry students, and people working in chemical laboratories will find the book invaluable.